Marburg virus was first recognized in 1967, when outbreaks of hemorrhagic fever occurred simultaneously in laboratories in Marburg, Frankfurt and Belgrade. A total of 31 people became ill, including laboratory workers, as well as several medical personnel and family members who had cared for them. There were 7 deaths among the reported cases. The first people infected had been exposed to African green monkeys or their tissues. After this initial outbreak, the virus disappeared. It did not reemerge until 1975, when a traveler, most likely exposed in Zimbabwe, became ill in Johannesburg, South Africa. 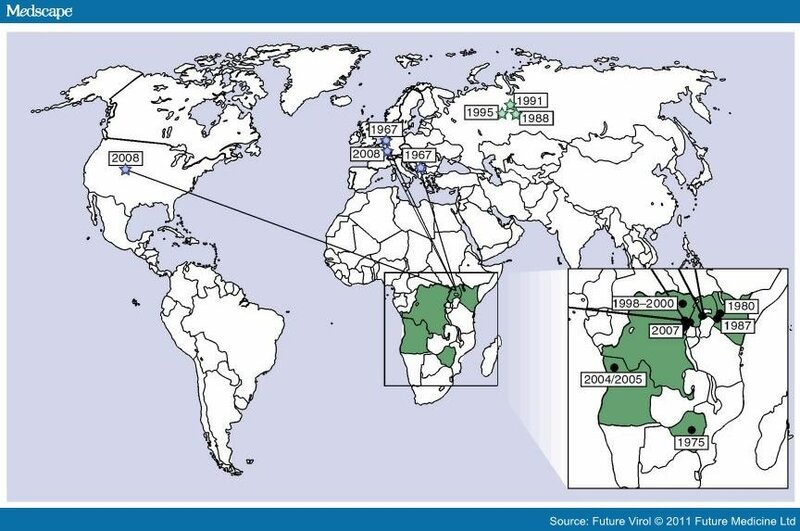 Confirmed cases of Marburg Hemorrhagic Fever (Marburg HF) have been reported in Uganda, Zimbabwe, the Democratic Republic of the Congo, Kenya, and Angola since that time. Cases of Marburg HF have also occurred outside Africa, though infrequently. In 2008, two independent cases were reported in travelers coming back from Uganda. Human infection results from prolonged exposure to mines or caves inhabited by Rousettus bats colonies. Just how the animal host first transmits Marburg virus to humans is unknown. However, humans who become ill with Marburg hemorrhagic fever may spread the virus to other people. Transmission is mainly human-to-human, resulting from close contact with the blood, secretions, organs or other bodily fluids of infected people. 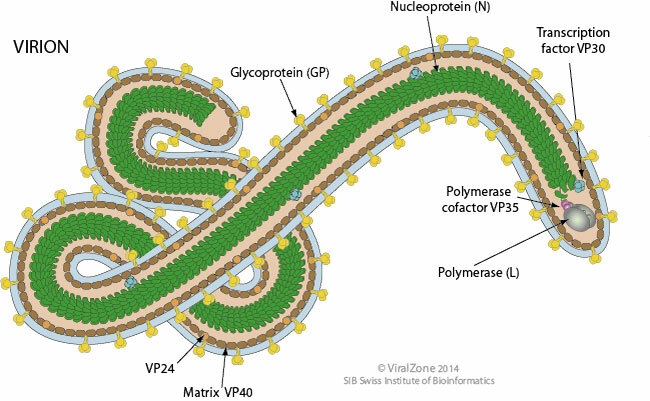 Furthermore, human-to-human transmission is similar to Ebola virus and, in general, other viral infectious diseases; due to these several similarities, they share the same precautionary measures and laboatory manipulation requires the highest biosafety levels. The severe illness results from a complex of pathogenetic mechanisms that enable the virus to suppress innate and adaptive immune responses, infect and kill a broad variety of cell types, and elicit strong inflammatory responses and disseminated intravascular coagulation, producing a syndrome resembling septic shock. Like all filoviruses, marburgvirions are filamentous particles that may appear in the shape of a shepherd's crook or in the shape of a "U" or a "6", and they may be coiled, toroid, or branched. Marburgvirions are generally 80 nm in width, but vary somewhat in length. In general, the median particle length of marburgviruses ranges from 795–828 nm (in contrast to Ebola virions, whose median particle length was measured to be 974–1,086 nm ), but particles as long as 14,000 nm have been detected in tissue culture.42 Marburgvirions consist of seven structural proteins. At the center is the helical ribonucleocapsid, which consists of the genomic RNA wrapped around a polymer of nucleoproteins (NP). Associated with the ribonucleoprotein is the RNA-dependent RNA polymerase (L) with the polymerase cofactor (VP35) and a transcription activator (VP30). The ribonucleoprotein is embedded in a matrix, formed by the major (VP40) and minor (VP24) matrix proteins. These particles are surrounded by a lipid membrane derived from the host cell membrane. The membrane anchors a glycoprotein (GP1,2) that projects 7 to 10 nm spikes away from its surface. While nearly identical to ebolavirions in structure, marburgvirions are antigenically distinct. Marburg virus disease is clinically indistinguishable from Ebola virus disease and can also be confused with several Equatorial deseases such as other viral hemorrhagic fevers, falciparum malaria, typhoid fever, shigellosis, rickettsial diseases such as typhus, cholera, gram-negative septicemia, borreliosis such as relapsing fever or EHEC enteritis. Differential diagnosis can be achieved thanks to the analysis of patient medical history (exposure to wild life and places he recently visited). MVD can then be confirmed by isolation of marburgviruses or by detection of marburgvirus antigen or genomic or subgenomic RNAs in patient blood sample during the acute phase of MVD. Marburgvirus isolation is usually performed by inoculation of grivet kidney epithelial Vero E6 or MA-104 cell cultures or by inoculation of human adrenal carcinoma SW-13 cells, all of which react to infection with characteristic cytopathic effects. Filovirions can easily be visualized and identified in cell culture by electron microscopydue to their unique filamentous shapes, but electron microscopy cannot differentiate the various filoviruses alone despite some overall length differences.Immunofluorescence assaysare used to confirm marburgvirus presence in cell cultures. Tests on clinical samples present an extreme biohazard risk and are conducted only under maximum biological containment conditions.